Some of the greatest documentaries have come out of the minute obsessions of average people. 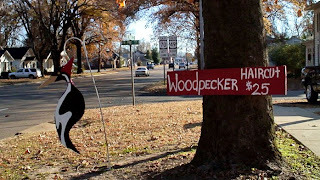 Such is the case with “Ghost Bird”, a minor gem of film about the impact of the rediscovery of a formerly distinct bird called the Ivory-billed Woodpecker in a small town in rural Arkansas. The effect of this bird, which 95% of the world’s population has never heard of, could mean the revitalization of the dying community. In 2005, in the small depressed town of Brinkley Arkansas, there was the first sighting of the thought-extinct Ivory-Billed woodpecker in 60 years. What's the 'Ivory-Billed Woodpecker' you ask? Well, for bird watchers, it's considered the 'holy grail' of birding - a large graceful bird made extinct through deforestation and other manmade developments. In late 2005 director Scott Crocker brought his camera to Brinkley to document the global media hoopla surrounding the event. We watch as word quickly spreads through the international birding community of the rumour, which is eventually backed up by video footage and confirmed by the US Dept of the Interior. Suddenly this dying working class town is infused with tourism, and mondo federal funds to help bring back the bird from extinction. But wait...slowly, with no pun intended, out of the woodwork skeptics emerge, who examine the evidence with a finer toothed comb than the enthused bird watchers. With the legitimacy of the sighting in question so are the lives of the town's citizens who cling to its discovery as the engine of the town's ressurection. Crocker is clever structuring the story. He introduces the enthusiasm of the Brinkley townsfolk to the woodpecker news like gangbusters, embellishing and exploiting the ridiculousness of the woodpecker-mania for humour. In a very short period a hotel renames itself the Ivory-Billed Inn, the world's only Ivory-Billed Woodpekcer giftshop opens and the local barbershop starts cutting 'Ivory-Billed' haircuts. Without knowing the significance of the bird and the context of the town, it all sounds so absurdly esoteric, like those endearing folks in Errol Morris' "Gates of Heaven." But as Crocker reveals more information he gradually turns the tables and switches tones, spinning the story around on itself. While I found myself laughing at the silliness of the hype, when we learn more about the bird and the town, sympathy and frustration sets in with their predicament. The town finds themselves caught in a situation of the government enthusiastically jumping to a conclusion and then crawling back all the hope it brought to Brinkley. The parallels of the bird’s extinction with the slow death of the town is poignant. While the industrialization of America saw the bird’s natural habitat torn down through deforestation, the reliance on the old industry which now has gone abroad, seems like really bad karma. Crocker also brings a distinct ear for music, a soundtrack which includes a melancholy original score mixed with discongruous pop songs from the Pixies, and the White Stripes. All of this adds up to a fun but immersive and reflective experience and one of memorable films from the Festival.